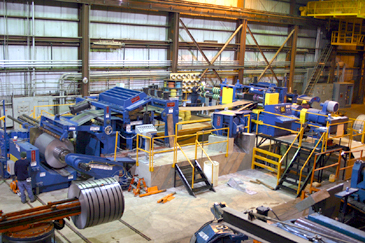 Oak Creek, WI - Steel Warehouse, a large flat rolled steel distributor and coil processor, has installed a new high-production Braner/Loopco single-loop Turret Head™ Slitting Line, equipped with a patented shape correction Cluster Leveler™, in its Oak Creek, WI plant, situated between Chicago and Milwaukee. The new slitting line joins a 1/4" x 72" Braner/Loopco Hydraulic Cassette Leveler/Servo Roll Feed Cut-to-Length Line, in addition to other lighter gauge coil processing equipment in Steel Warehouses' Oak Creek facility. The Slitting Line is capable of slitting and corrective leveling 60,000# x 72" bare and galvanized cold rolled coils, as well as hot rolled coils, in gauges from 1/4" down to .015" - at line speeds to 1,000 FPM. 60,000# x 72" x .250"/.015" Slitting Line. Rugged Mill-Duty Design: All components that comprise the Braner/Loopco slitting line are designed and built with a generous service factor that assumes the equipment would be operated in a multi-shift high-production operation. Maintenance costs and down time for parts replacement is minimized by employing heavy welded steel plate construction and heavy-duty components supplied by top rated and widely distributed industrial component manufacturers. All hydraulic cylinders are 3,000 PSI rated commercial tie-rod design, all gear reducers are AGMA rated commercial helical gear boxes, and the absence of high-maintenance chains and sprockets is noticeable. The new Steel Warehouse slitting line joins more than 560 Braner/Loopco slitting lines still in operation around the world. 250 HP Recoiler, Adjustable Overarm & Cluster Leveler. 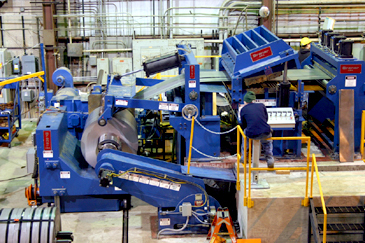 Shorter-Is-Better: The Steel Warehouse slitting line employs the "shorter-is-better" concept that consumes less floor space (than typical slitting lines), allows for quick and easy coil threading, and improves personnel safety and productivity by placing all line components, from entry end to exit end, clearly within the operator's view. The short line makes delicate cameras and hard to view TV screens unnecessary. Although the Steel Warehouse slitting line includes a Cluster Leveler and an extra long looping pit, the slitting line is less than 50' from Uncoiler to Recoiler. The slitting line also employs the modern "hi-pass line" equipment arrangement wherein the strip processing equipment is elevated above the coil OD to eliminate "back-bending" the strip as it is processed. Hi-pass line eliminates equipment-induced coil-breaks, eliminates top-running pass line rolls that can damage the strip surface, and produces straighter sidewall coils because the strip is never reverse bent. Turret Head™ Slitter: A 9" arbor x 150 HP two (2) head quick-change Turret Head Slitter produces precise tolerance slit widths throughout the entire gauge range. The arbors rotate in precision machine tool bearings mounted in one-piece stress-relieved and precision ground solid steel block arbor bearing housings weighing 1,900# each. The rotatable Turret housing is supported on a 300,000# capacity anti-friction bearing, while the hydraulic cylinder positioned outboard arbor bearing housing is mounted upon precision anti-friction machine tool slides.